Doug: Happy Wednesday, O' Faithful Ones! We're back at a fun little BAB category we call "Why Can't We Be Friends?" It's been awhile since we looked in on Iron Man and Subby, and Spidey and Luke Cage. 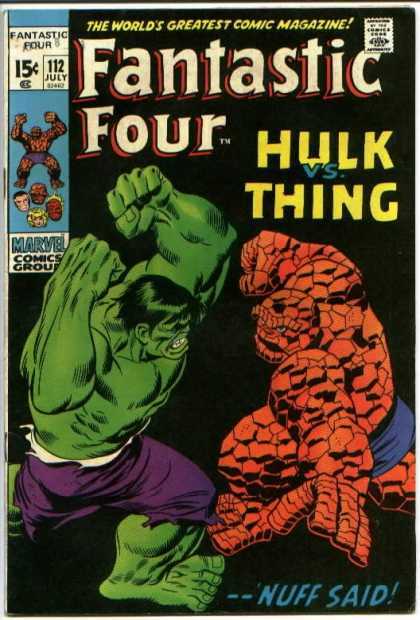 Today we begin a 3-parter spanning Fantastic Four #'s 112 and 166-167: Bronze Age Thing/Hulk tussles! Karen: This was a sheer joy to read again. The first FF comic I can recall getting was FF #111. These were some exciting issues. They seemed to move at a fever pitch. Doug: Stan remarks on the first page, "As the rampaging Thing battles the police in Central Park, the hate-maddened Hulk attacks him! And that's all we need to know!" Uh, well... no Stan. It's not. Why is the Thing fighting the police? How did the Hulk get to the heart of Manhattan? Where is the rest of the FF? We soon get up to speed, but I thought that was a funny way to start a book. 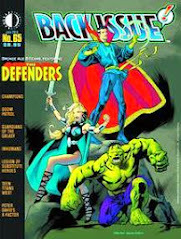 To me, Marvel's strength in this period was it's long-running stories with subplots, tales beginning halfway through one book and ending a book or book-and-a-half later, etc. Karen: It's been my feeling that as Stan approached the end of his writing career at Marvel, his stories became more rudimentary. Of course, the guy had been writing Marvel's entire line for years, so I think he can be excused for easing up a bit later on. Even so, this is still a very exciting story. Buscema's art is textbook super-hero dramatics. Doug: As I went through this story, I was continually struck by what a true mismatch this bout should have been -- Ben enraged notwithstanding. 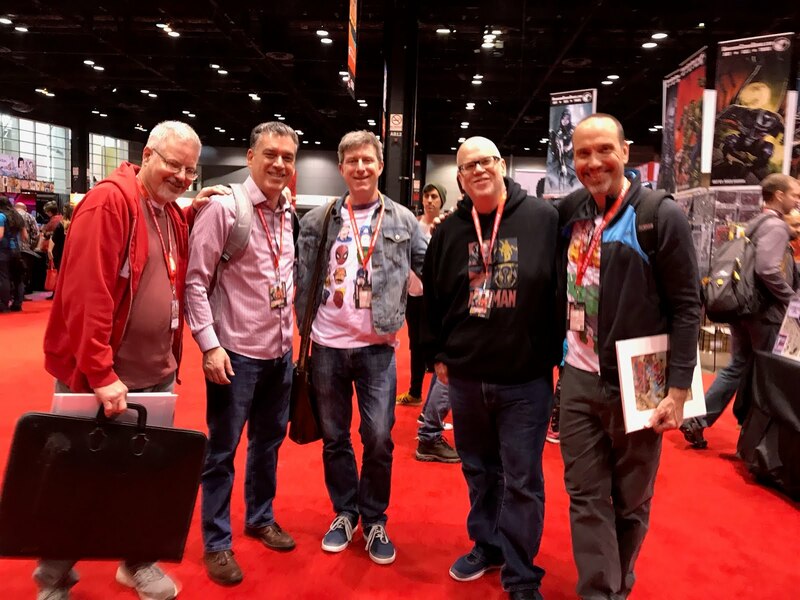 Consulting the traditional Official Handbook of the Marvel Universe, I reminded myself that the Hulk is 7' and 1000 pounds; Ben is only 6' and 500 pounds. But Buscema managed to convey to the reader that Ben was holding his own. Karen: What I love about Hulk-Thing fights is the fact that everyone knows Ben is the underdog. But his great determination keeps him going (this is especially evident in FF #'s 24-25). He's like the Rocky Balboa of super-heroes. Doug: The slow reveal is that Ben has run amok and is out of control, encountering Bruce Banner -- who ironically had been enlisted to assist Reed in helping Ben! 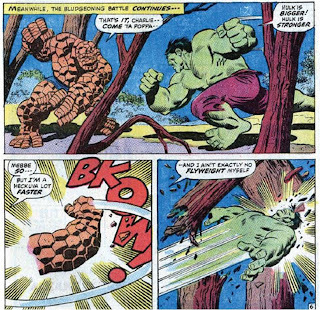 Banner, seeing the duress that the Thing was being put under by the authorities, loses control and becomes the Hulk. Karen: You know, for being the smartest guy on Earth, Reed is pretty dumb sometimes. He summoned Banner to the Baxter Building but had no idea he might Hulk out? Oh come on! Doug: While Ben battles the Hulk, Reed is of course holed up in the Baxter Building laboratory trying to find a solution to cure Ben's madness. 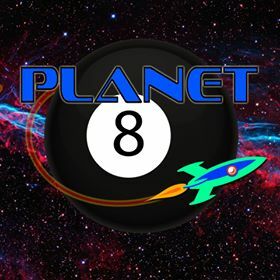 Johnny wants to fly out to help Ben against the heavy odds, but Reed won't hear of it. In fact, as Johnny flames out of the window, Reed douses him and reels him back in. Johnny's not happy, but he defers to his brother-in-law's leadership. 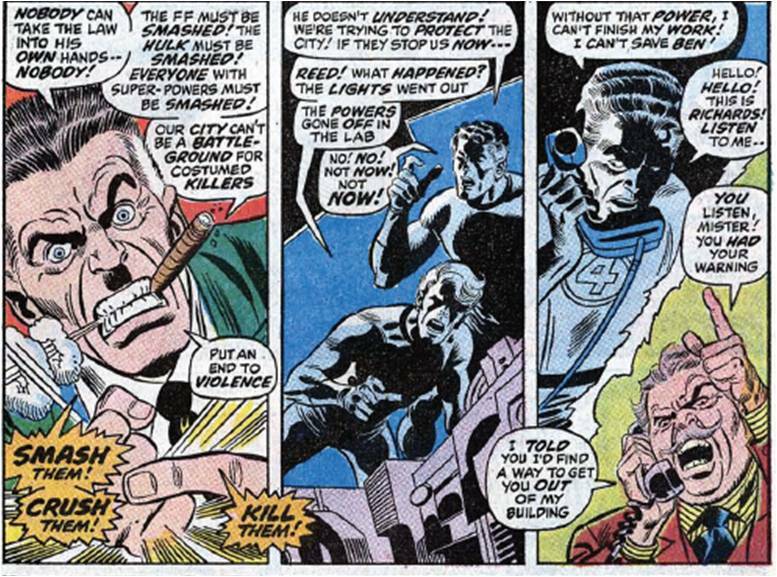 Another burgeoning subplot is that the public (enflamed by none other than J. Jonah Jameson) is turning against the FF. 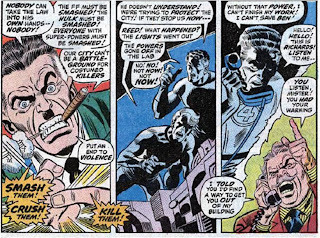 Karen: I got a big laugh out of that panel with a rabid JJJ yelling, "Put an end to violence! Smash them! Crush them! Kill them!" Boy, he'd do great with his own talk show today! Karen: One thing that did bother me with this issue was the lettering. This was during a time period where I noticed that sometimes the letterer did not punctuate sentences properly - there are no periods at all in this issue. Many sentences end without any punctuation, except the ones that end in exclamation marks. Doug: Basically 80% of this issue is an all-out war between the Thing and the Hulk. Buscema really moves the action, and his camera angles often add superior emphasis to the power generated by these two combatants. Trees, sculptures, an obelisk, a merry-go-round, a chimney, and a water tank -- all of these become weapons, projectiles, or simply tools in the hands of Ben or the Hulk. As the story wears on, what we all know to be true comes to pass: the angrier Hulk gets, the stronger Hulk gets! And as Ben starts to run down, he is distracted by his love-come-looking-for-him, Alicia... at the same instant the Hulk delivers the death blow! 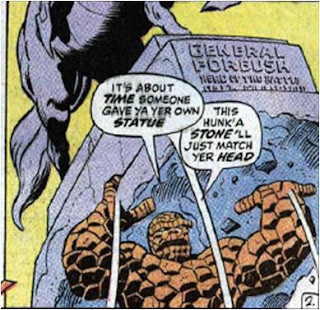 Karen: I enjoyed the Thing heaving a statue of 'General Forbush' at Hulk. And the merry go round reminded me of issue #122, where Thing hurls a ferris wheel at Galactus. I've said it before, but I do think Stan had some sort of preoccupation with circuses. Although it's possible Buscema added these elements himself. Doug: Reed and Johnny arrive with the gizmo Reed had insisted on building to save Ben; in a scene eerily reminiscent of the plot of FF #'s 140-141, Reed is left holding a gun-like device he's concocted to save someone dear to him. But unlike what will happen in several issues when he has the opportunity to affect his son Franklin, here he arrives too late to do anything other than apparently mourn over his still friend. Karen: And of course Johnny is there to blame Reed. And why is it that Reed's 'helpful' devices always look like guns? I just read Incredible Hulk #152 the other day, and the machine Reed made to cure the Hulk also looked like a gun. Some sort of subconscious problem perhaps? Karen - if I recall correctly, the problem with the punctuation marks was a result of some printing issue - I remember there were letters to the editor (or perhaps just one in the bullpen page) asking why every sentence ended with an exclamation point. The answer had something to do with periods being lost in the printing process, and this period was an experiment to see if they could get past that. Steve, that's enlightening, I had never heard that -or any -reason given for the mysterious missing punctuation! Thanks for relaying that. This along with issue #111 started a life long love affair with Comic books, and with the Thing character in particular! 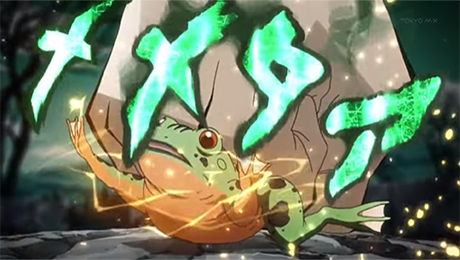 This was just sheer magic to my 10 year old mind and you know what, it still is, all these years later. Truly an epic that was near the quality of the lee/kirby run. Sadly Marvel has ruined the Fantastic Four and the Thing character over the last 10 years. Read this if you want to know EVERYTHING about "Hulk vs Thing!!" i have this comic - is it worth much? "Karen: It's been my feeling that as Stan approached the end of his writing career at Marvel, his stories became more rudimentary." Lee's career has ended with the departure of Kirby. No more new series or new ideas. Sorry Mario, I just don't buy that. I give Kirby and his wonderful imagination its due, but Stan brought an awful lot to all the titles they worked on. Once they parted ways, I don't think either man produced anything nearly as good as the works they'd made together. After separation, Kirby created the Fourth World, Kamandi, Omac, Demon, The Eternals, Mister Machine, Devil Dinosaur, Captain Victory, Silver Star and Arnim Zola, Mr. Little, Princess Zenda, etc., etc. After separation, Lee created ............................. ah! Ravage 2099. Sorry I'm sarcastic, I really do not know who wrote the stories of the duo and who invented the characters (Kirby had done the Challengers of the unknown, Thor had used in his old stories, and Captain America is not in question), but is a fact that, after the separation of the two, Lee pulled on for two years without a new idea or new characters and then retired. No worries, Mario, part of the fun is 'debating' things here. I would suggest that the list of creations you cite from Kirby post-Lee illustrates just how much his work declined after the two parted. None of those come anywhere near matching the FF, Inhumans, Galactus, Black Panther, Silver Surfer, Thor, High Evolutionary, etc. Also, while Kirby was still working on comics full time, Lee had moved on to become publisher at Marvel and was handing off titles left and right to Roy Thomas, Gary Friedrich, and Gerry Conway. 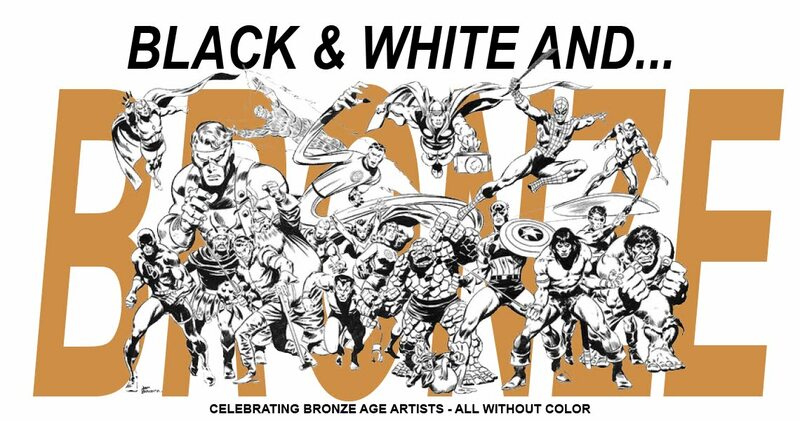 Even so, Thomas credits Lee with coming up with at least the initial idea for most of Marvel's monster characters in the 70s, as well as developing the black and white magazine line. Thank you for your courteous response, we disagree, but thanks. I say once again and I stop, because it's too long discourse and in the end everyone has his opinion. For me, the Eternals have more personality of the Inhumans. There is more humanity in Loser stories than in Nick Fury. Galactus is not better than Darkseid, and Orion or Metron or Izaya or Kroo or Sersi or Mister Machine are characters with an articulated personality. Kamandi (angry, combative but nice) is the young Kirby like The Thing is like the old Kirby. The writing style of Stan is definitely filed, albeit with respect to what has been and now is more a historical curiosity than an example for new writers. Kirby (and Ditko), still have much to teach, and not surprisingly they do. and thank you for attention. Mario, I think you are right, we will have to agree to disagree. But I would love to hear your thoughts on our recent reviews of Kirby's work when he returned to Marvel in the 70s. "The coming of the Over-Mind" saga was one of my favorites as a kid. It still holds up pretty well, especially this Hulk-Thing fight. 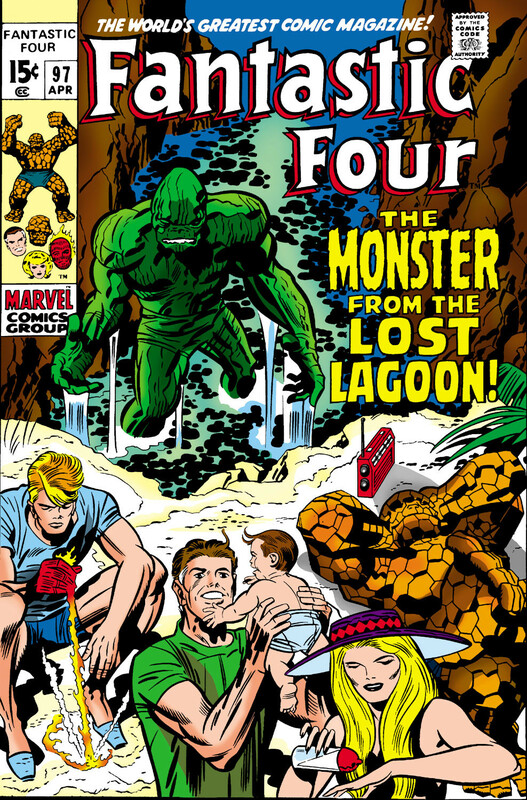 As far as the whole Lee/Kirby stuff, I happen to think Lee's FF after Kirby were some of the best. This issue is a good example. 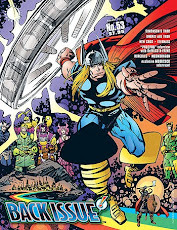 Yeah, Kirby's DC stuff is pretty cool today, but at the time none of it sold worth a damn, and he came back to Marvel. I agree with Karen, the whole was greater than the sum of it's parts when it came to Lee/Kirby. By this time, Lee was spending an inordinate amount of time trying to get Marvel Hollywood going, so I'm surprised he did as much as he did. June 1976: More Marvel Comics Cover Logos! June 1976: Marvel Comics Cover Logos!